and try novel social and economic experiments without risk to the rest of the country." "Only a fool learns from his own mistakes. The wise man learns from the mistakes of others"
It has now been a full year that I-594, an initiative requiring universal background checks for gun transfers in the State of Washington, was implemented. Before I-594 a resident of the state could sell or gift a gun to another resident of the same state by just handing them a firearm. Now, both parties have to go to a licensed firearms dealer, wait for up to ten days (and under certain conditions, up to sixty) for a background check, and only then transfer the firearm to the new owner. Universal background checks have rather strong support among people who are not very familiar with guns. In WA, it passed 59.27% to 40.73%, but it did a lot better in King County (where gun ownership rate is 24%), at 75% in favor, compared to outside King County (where the gun ownership rate is 37%), at only 54% in favor. Parenthetically, though the gun ownership rates in King County are a good 30% less compared to the rest of the state, firearms homicide rate is 15% less outside King County. So what did this do to the homicide rates? 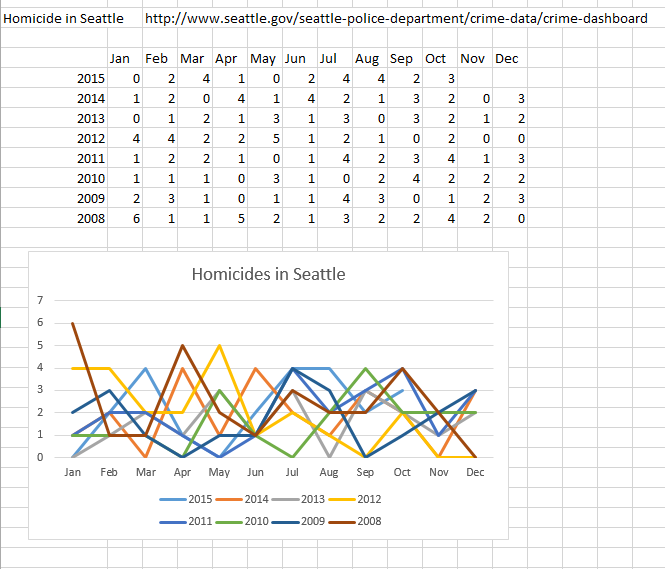 Seattle Police Department has a helpful web site where homicide stats are published: Crime Dashboard. I could have run a proper regression for you - but it is quite visible to a naked, non-Exceled eye that there is no homicide reduction of any kind that I-594 produced. You can also see that there is no "gun violence epidemic" which, according to the gun prohibitionists, is gripping our "bloodsoaked" streets - the rate of gun violence has been holding steady, and 2015 (or 2014, or 2013) does not standout in any way. Here are the monthly homicide numbers for various years. Do you see I-594 here? I don't. You don't, either. Incidentally, the prohibitionists agree: halfway through they year they started the push for another gun control measure, a "tax" on firearms dealers in Seattle designed to run them out of town. Their motivation? Despite I-594, they claimed that we are "in the middle of gun violence epidemic". Again. Talk about the boy who cried wolf! Could this have been predicted if anyone in this country approached public policy rationally, with data? Why, yes, it could have been. You see, states are indeed a laboratory of democracy, and Washington State is not the first experiment staged in this lab. In 2000 voters in Oregon and Colorado decided to close the so called "gun show loophole" and require background checks to be done at the gun shows. 9 states had similar provisions on their books by then, which made 11 in total. We also have the nationwide breakdown of murder rates, by state (NATIONWIDE MURDER RATES). 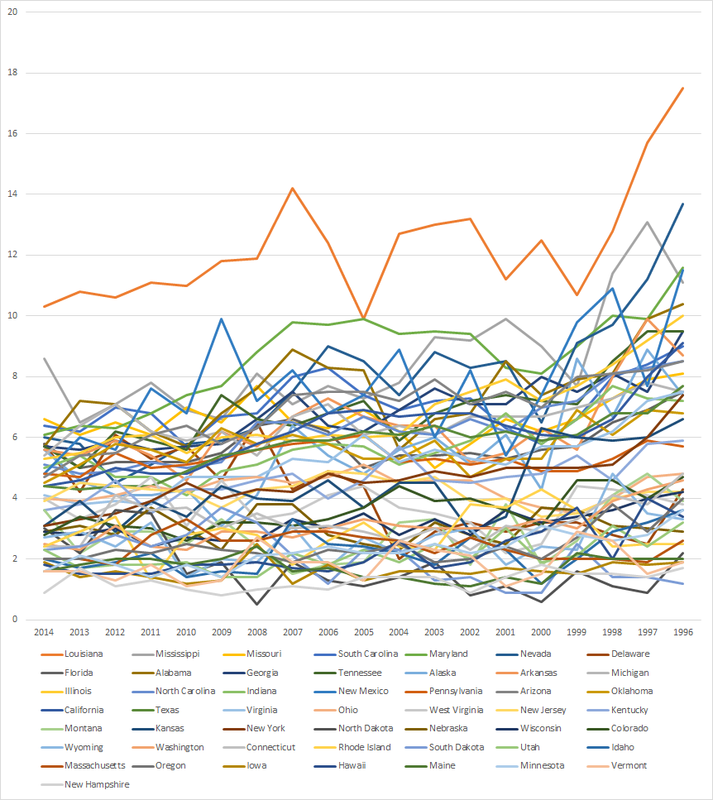 As you can see, in the last 20 years the homicide rates in all states were dropping. But were they dropping faster in the states with more gun control? 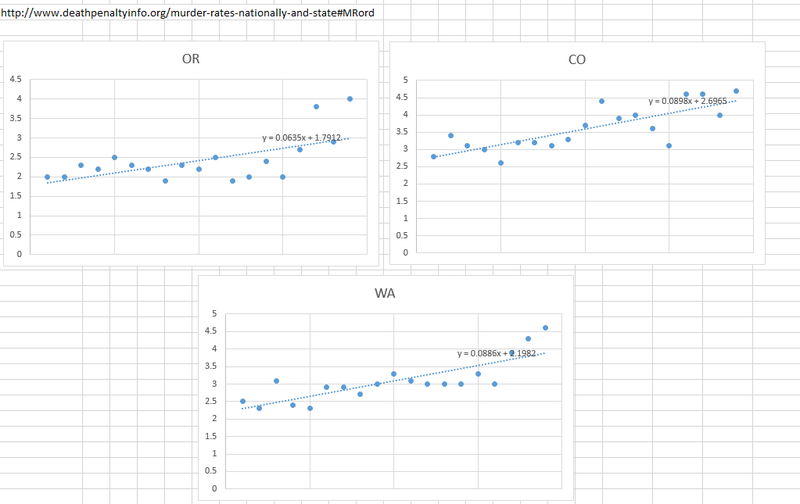 Let's plot the murder rates for 3 states: OR, WA, and CO. If you feel like playing with the numbers yourself, you can download the spreadsheet here. Culturally and geographically these 3 states are quite similar, yet two of them have instituted the background checks for gun purchases in 2000, and the Washington did not. As you can see, the rates dropped about the same in 2 states that had "gun show loophole" closed as they did in WA, where it remained wide open throughout all these years. The homicide rate actually dropped slightly faster in WA than in OR. "Gun show loophole" clearly did not matter. Why is that? At this point people start talking about "iron pipeline" and quote the NYT article that supposedly shows that guns recovered at the crime scenes in states with stricter gun control are transported from the states with the looser one. If only strict gun control was the norm everywhere! As always, this explanation is "common sense" if you don't understand how gun market operates. It is obviously true that more guns are sold in the states where guns are more popular (and where therefore the gun control is looser). When the article implies though - that the guns there are sold to either the perpetrators of the crime, or the people who ferry them to the perpetrators - is not at all a foregone conclusion. Since we don't have a national gun database, it is almost impossible to trace a gun once it is sold retail the very first time. When the gun is traced, the FBI calls the manufacturer and asks them who was the distributor who received the gun from them. Then they call the distributor and find the retail dealer who got the gun from that distributor. Then they call the dealer and get the form 4473 which identifies the consumer of the gun. This is where the trace stops, however. Reaching consumer is quite often impossible, compelling them to tell where the gun went after is not always possible for privacy reasons. The gun could have been sold by the consumers a few times - with or without a background check, through private transfers or on consignment through a dealer - there really is no way to find out without sending a trace demand letter to all FFLs (which number, as of this writing, over 76000). As anyone who have ever been to a gun store knows, the market in used guns is humongous - most gun stores have far more used guns in their inventory than they have the new guns, and the probability that the gun have changed many hands - legally - before it ended up at the crime scene is very large. So at the very minimum it requires some evidence which so far no one could produce to prove that the evident ineffectiveness of universal background checks is due to the neighboring states with lax gun control. There is, however, a simpler explanation. Vast majority of shootings in Seattle - at last as of recent - was generated by gang activity. Chicago Police Commissioner attributed 80% of homicides to gangs. As an owner of one of the two biggest gun stores in Seattle, I do not see criminals being stopped by the universal background checks because they do not come to my store to perform one in the first place. We see extremely few background checks that end up in DENY response - perhaps one in 500. Some of the very few denials we see result from two factors - drunk driving and anger management in the past. Majority of denials, however, result from a mistaken or stolen identity, and several people have successfully challenged them and gotten their rights to purchase the firearms back. Only one denial in the whole year happened in the context of a private transfer. In all these cases the people did not expect to be denied, because they did not realize that an anger management class taken in the past, or a drunk driving offense committed in their youth would prevent them from owning a firearm. The people with active criminal history don't come to the store in the first place - they know that they would be denied - yet have no problem obtaining the guns. The truth of the matter is there are already 300 million guns in the US, unregistered, - one for every man, woman and child. Expecting that constraining supply now would affect availability so much that a determined person would not be able to get a gun is pure fantasy. Despite the new requirement for the background check, it is still extremely easy for anyone to sell a legal gun to a criminal. All they need to do is report the gun as stolen, or lost, after the sale. There is no penalty in our state - or anywhere - for losing a gun, so long as it is duly reported. The new law may stop a massive gun trafficking operation, but there are no proof that it existed in the first place - most criminals surveyed say that they get their guns from friends and family in one-off transaction. And the real culprit in violent crime is not the guns anyway - homicide rates are much better correlated with inequality than with availability of guns, and as Australian example demonstrates, even if we were to somehow succeed in making guns disappear, gun violence might indeed drop, but overall violence will remain the same. The anti-gun lobby spent $10 MILLION DOLLARS pushing this measure - which is not likely to have saved a single life so far, and is unlikely to do so in the future. On the contrary, investing this money into something useful - cancer research, drug addiction, drunk driving prevention programs - without a question would have saved lives. So why did the measure pass? First, no one was interested in actual data. Anti-gun cause to Democrats is what global warming is to Republicans: a matter of faith, not science, to be used by dishonest politicians to create a red meat issue to distract the population from real problems which they have no intention to solve. Facts, numbers, logic are in the way: it's hard to make a person understand something when his or her salary depends on not understanding it. At some point though we need to get our political class under control: what they do is running the country off the cliff. Real wounds fester while we fight over fake issues. Friends, don't let friends allow stupidity control public policy!